Julian de Guzman, a trailblazer for Canadian soccer, announced his retirement Monday at a press conference in the Nation’s Capital at TD Place – the home of his final professional club, Ottawa Fury FC. A professional career that spanned 17 years, de Guzman featured in more than 500 contests for club and country and leaves behind a career filled with accolades. A former Canadian Player of the Year, de Guzman retires as his country’s all-time appearance leader earning 89 caps in his 15-year international career. He was named captain of the Canada’s Men’s National Team in 2013 and wore the captain’s armband in 25 matches. He took part in four cycles of FIFA World Cup Qualifiers and a Canadian record six CONCACAF Gold Cups, earning tournament MVP honours in 2007 when Canada reached the semi-final phase. He was a tournament all-star in 2007, 2009, and 2013. "Julian de Guzman is a Canadian soccer trailblazer whose impact on the game will be felt well into the future," said Victor Montagliani, President, Canada Soccer. "We would like to thank Julian for his hard work, perseverance and leadership over his 15-year career and wish him the best as he prepares for the next chapter of his career." At the professional level, his remarkable career took him to France, Germany, Spain, USA, Greece and of course his native Canada, where he fittingly concluded his career. He was most notably the first Canadian to star in Spain’s La Liga, starring as a midfielder for Deportivo La Coruña. It was during that stint that de Guzman won Canadian Player of the Year honours (2008) for his play at both the club and international levels. That same year he was also named Player of the Year for Deportivo La Coruña. In his first foray playing in Canada, de Guzman became the first-ever Designated Player in MLS history and helped Toronto FC come within a win of reaching the 2009 playoffs. He then helped the club win three consecutive Canadian Championships from 2010 to 2012. The midfielder from Scarborough concluded his professional career in Ottawa where he helped Fury FC claim the NASL Fall Season Championship in 2015 and was named the second captain in club history for the 2016 season. 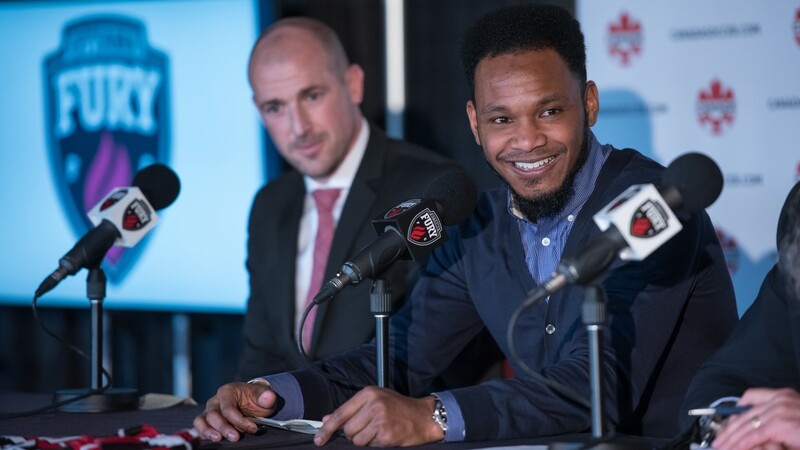 The Fury FC and Canada’s Men’s National Team captain won’t be leaving the game however, as de Guzman and the club announced that one of Canada’s pioneers of the sport will remain with the club serving as Assistant Coach and Assistant GM. The decision to step behind Ottawa’s bench and assist Paul Dalglish instead of pushing for one more year came after a long reflection for de Guzman. He retires from active play having played 513 games and 38,221 minutes for club and country in a 17-year career that in addition to representing his country saw de Guzman feature in Germany (FC Saarbrücken II, FC Saarbrücken, Hannover 96, Jahn Regensburg), Spain (Deportivo La Coruña), Greece (Skoda Xanthi), United States (FC Dallas) and Canada (Toronto FC and Ottawa Fury FC). His international career spanned 15 years from 2002 to 2016. Initially a youth player with Wexford SC in Scarborough, he was 18 years old when he joined the national youth program in 1999. Before making his international "A" debut in 2002 at age 20, he represented Canada at the FIFA U-20 World Cup in Argentina, in 2001. Fury FC will honour de Guzman and his career at a game this season. Further details will be unveiled at a later date.